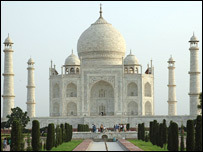 BBC NEWS | South Asia | Taj Mahal - not so wonderful? The current seven wonders list was drawn up more than 2,000 years ago. But one world famous building that isn't doing too well in the poll is India's Taj Mahal. The stunning marble monument to love was on the list of 21 sites short-listed last year for the global poll. It needs to make it to the top seven to qualify as a new wonder in the poll, organised by The New Seven Wonders Foundation, a privately-funded Switzerland-based organisation. Results of the online votes and votes through mobile phones will be declared on 7 July. Brazil's President Lula de Silva used a radio address to tell people how to vote for Rio's statue of Christ the Redeemer. The government of Peru has opened computer terminals in public plazas to encourage people to vote for the ancient city of Machu Pichu. But, the lack of enthusiasm in India to vote for the 17th-Century Taj Mahal has been striking. India has around 170 million mobile phone users and one person in every 50 has access to a personal computer. But lacklustre voting over the past few months has seen the Taj Mahal get just enough votes to get at the bottom of the top 10 list. Until a few weeks ago, there was virtually no information about the campaign. Although some private television channels are now calling upon people to vote, most people are yet to hear about the campaign. A special composition by ace musician AR Rahman, 'India Unites for the Taj', to drum up support for the monument has come a little too late in the day. And worst of all, many say, the Indian government remains completely aloof from the campaign. When asked, a senior official in the tourism ministry, Leela Nandan, said: "There is much more in India than the government. It is the people of India. Every member of Indian society has to take this responsibility." Bharat Kapadia is chairman of private media group I Media Corp Ltd, which has stepped in to galvanise public support for the Taj. "We need lots of votes. It is sad the government has not mobilised any resources for this. We are in dialogue with the tourism ministry and others. They had nothing more to say than tell us that it is a good project," said Mr Kapadia. Many ordinary Indians are backing Mr Kapadia's work. "Why is the government shy to launch a nationwide campaign for the Taj?" asks Sharda Sharma, an employee with a multinational company. She says she had no idea about the global campaign till a few days back. "Whichever way the vote goes at least it will only help promote Taj Mahal and India," she said. India is a country of vast natural and scenic beauty, but it attracts far fewer tourists than some of its south-east Asian neighbours. It is only in the last few years that the number of tourist arrivals has gone up in the country. The Taj Mahal and the other top 20 contenders were on an original list of 77 sites. In January last year, an expert panel headed by former Unesco chief Federico Mayor came out with a shortlist of 21. The Taj was built by Mughal emperor Shah Jahan for his favourite wife Mumtaz and also figures in the UN cultural agency's World Heritage list.